All but the cleaning up to do. Fished one spot yesterday afternoon for the pups and could have caught them for hours, We ended up landed double digits per angler with a few over the slot and busted off one big one on the mini rod, then left for more of the big 'uns, fished two spots and had did not have a bite from either location. Sure there are still some around and you've got a decent chance if you spend the time looking for them, but I imagine that the red tide has arrived at Ocracoke Inlet. Take care of them for me Norman. 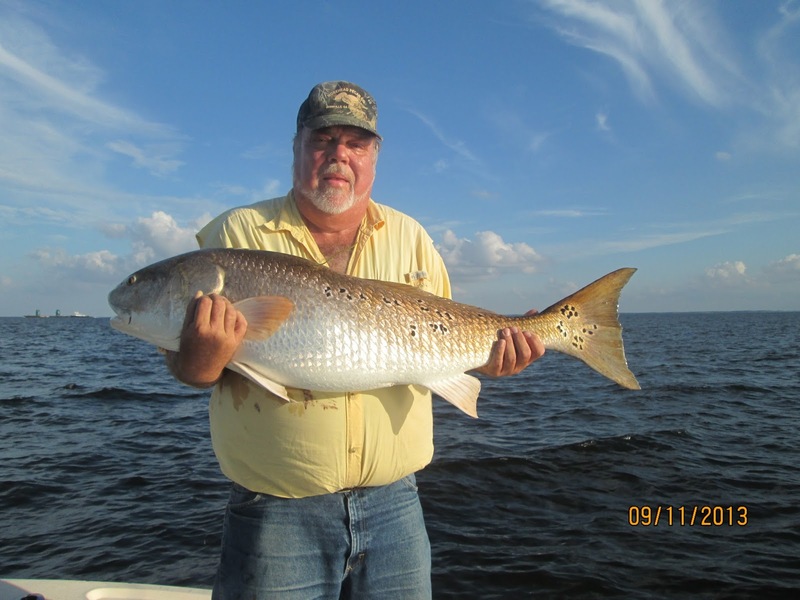 For those of you who want to go and experience red drum fishing as good as anything in Louisiana, Texas or Florida, we've got it right here, right now and right along through November. I would recommend a full day. don't expect a giant, but it could happen at any time. "Capt George and Anna, hope all is well! My wife Kylie said she was going to hire another guide if I didn't find time to put her on some Drum. Needless to say I quickly went after some quality fish. What an awesome season it's been! Also I wanted to thank you for the business and believing in me to provide a professional service." Capt. Mitch has done a great job for us this season and we look forward to working with him more in the years to come. Mitch is running a skiff and a comfortable center console. He is the man for those Albemarle Sound striped bass, the same fish we're catching in Weldon, he is harassing through the winter. 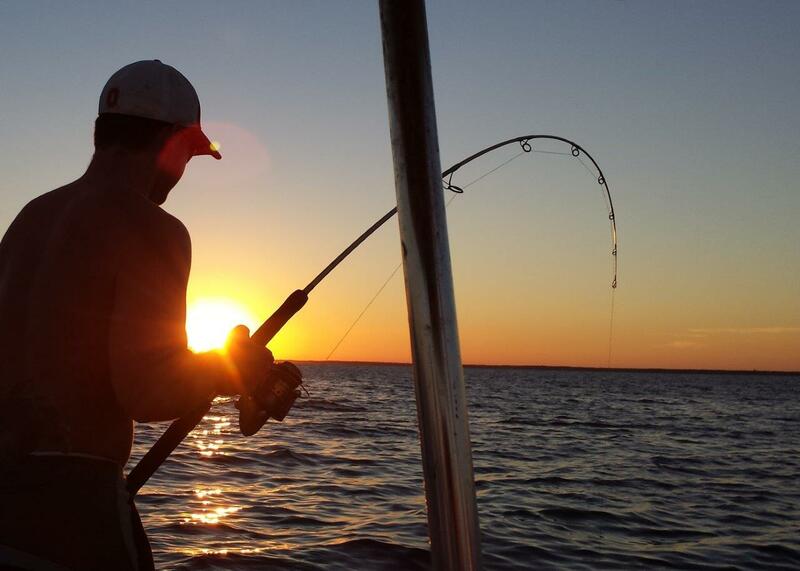 Anytime you need a fishing fix, give us a ring and we'll get you set up. Double digit days with the pups and paperwork for citations. I'll be wrapping up my time here this weekend with a nor'easter sending me on my way. The puppy drum fishing is still really good to "epic" and will remain so through the winter. There should be opportunities for big 'uns at any time, duck hunters reported catching them last January, so as long as the water stays above freezing, they will not all be gone.....although the mass exodus has begun. If you want in on the action, we can still get you out there with the Down East Guides who have not yet given up on them. Although my time here has come to an end this season, I'll still be fishing, a few days in Morehead City if the wind will ever stop blowing, then Costa Rica for some much needed payback on the tarpon. Anna and I will be joining Never Enough and the Big Dipper for a couple of days, followed by a couple of days of billfishing....hopefully some casting poppers at big yellowfins, then playing with the miniature yellowfins, actually albies......but also kings, groupers, sea bass and whatever else Anna will let us catch at the beach. I have plenty of openings Oct. 24-31. North Carolina's red drum fishing really impressed this group of ladies from across the country, including Louisiana, Florida and Texas. 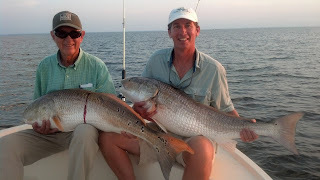 We proved to them that we have as good "redfishing" as any place in the country. Period. On the first afternoon, I did not contribute much to the big drum fishing, only catching one big one. Fortunately, the other Down East Guides, Capts. 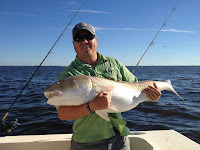 Justin Haddock, Brian Harrington and Greg Voliva, held up their end and introduced the ladies on their boats to a double digit afternoon of giant red drum. The morning of day 2, I changed strategies. We went beating the banks and found a nice school of keeper "reds", catching at least 25 on light tackle off of one point. But for the afternoon session, I was still not in the groove and was only able to put each of my ladies on 1 trophy sized drum. The last day of their trip I was determined to find the mother load......and I did. If felt good to call Justin and Greg into the bite, we had an EPIC afternoon. Meanwhile, Brian was doing so good beating the banks, he never switched over to the big ones, guiding each of his ladies to over 25 releases of keeper sized puppy drum. For 4 guides, fishing for puppy drum for the majority of the day, well over 150 puppy drum were landed. I haven't talked about any specific numbers of the big drum all year and I'm not going to start now. 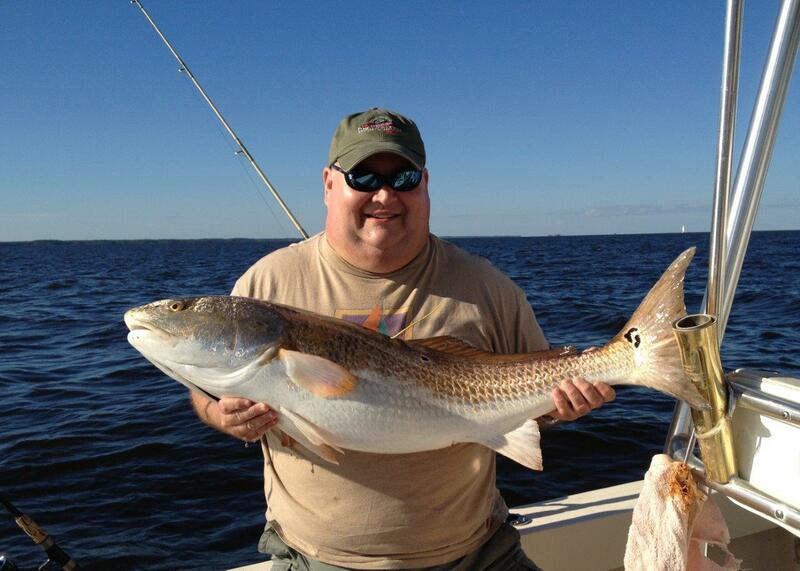 Like I said in the beginning of the season, if everyone on the boat catches a big drum, that's a success. 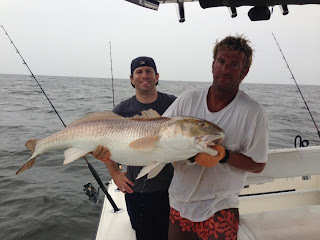 Where can you have that kind of consistency catching 40 pound red drum? If everyone catches a couple, that's usually at least a handful for the boat. More than 2 or 3/person is a double digit day and that's where we stop counting. We had 6 boats fishing with 18 customers today and everyone got their citation drum. 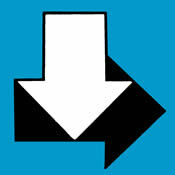 For some of the guides, we got just what we needed, some of the guides showed their customers a double digit day. That's what is for lunch tomorrow for the 12 ladies from the IWFA and their guides tomorrow. They got a good introduction this afternoon, double digit days for 3 of the guides and some of the ladies. My crew caught puppy drum for ceviche tomorrow......we struggled on the big ones, but we managed to catch one. I'm glad this ain't a competition. 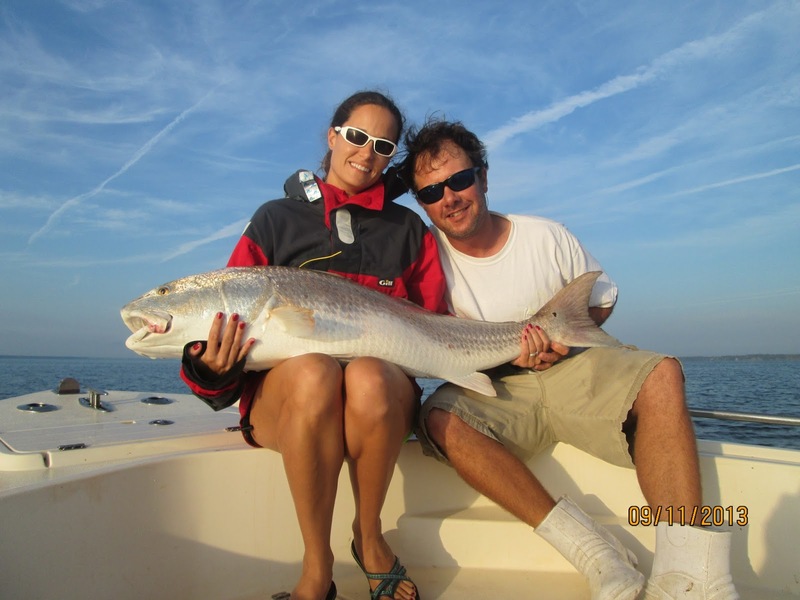 River Dunes and the Down East Guides would like to welcome the ladies of the International Women's Fishing Association. Twelve ladies from around the country (and other countries) have joined us for 3 days of drum fishing. We'll keep you updated on their fishing......which they take very, very seriously. Nor'easter. Full moon. Yeah, it's good, if you can stand up. Here are some of the photos from our Saturday afternoon. Lee just finished up the 9 day trip tarpon fishing in Costa Rica that we organized for him. I've got to get in on some of this action and will be going down in a few weeks. Anyone want to come along? "..... 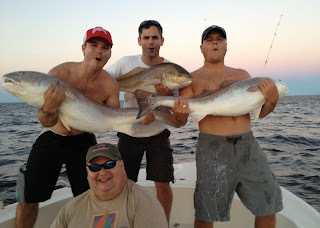 The best fishing trip of my life.....We boated 44 fish in nine days. We jumped 78 fish. 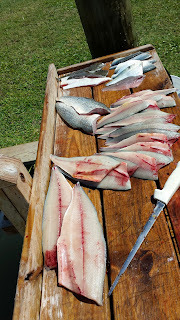 We caught 4.9 fish per day.......20 fish were larger than 100 pounds, 12 fish were 150 or better. Two 170s. 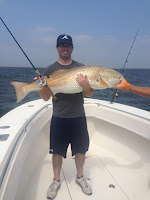 Also caught the biggest fish of my life at 200 pounds and 205 pounds. All fish caught on the fly. Every one of my wishes came true on my 62nd birthday trip. The weather looks great for the next two weeks you should have a fabulous trip....."
Got home safely. We had a great trip as always. Thanks for what you do and cork me a another one or two next time out. Check out the spots on this one. See the attached pictures. Jeff, Brady, and Ryan had a great time. This was Brady and Ryan’s first time catching these big fish and Jeff’s first time with the corks. I found the key to Pandora's Box about three season's ago and slowly opened it. Late last summer and into early fall the box was open enough that things started to click and this summer the lid blow off. The cork craze seems to be in full swing and since George has included it in his Rant, amongst other things, let me through in my two cents. 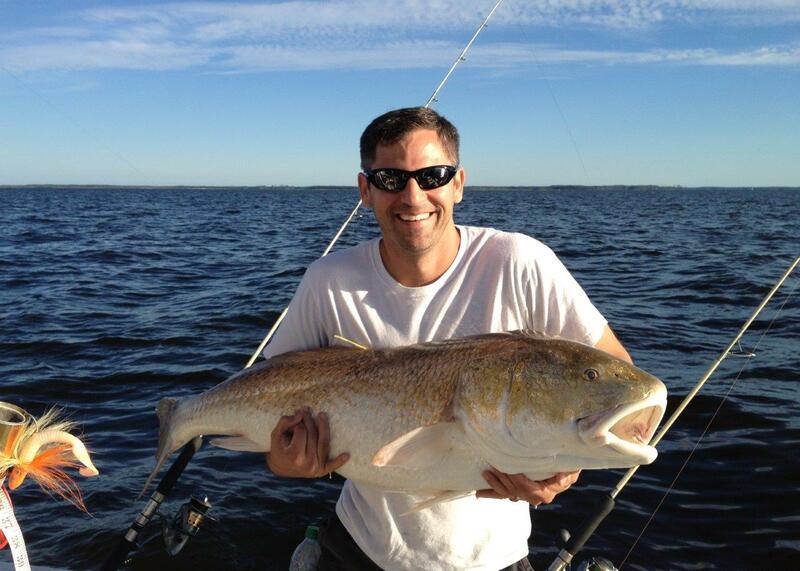 I am thrilled to see some many anglers catching fish without bait. As an angler, you are fishing and you get to experience the bite on a world class fish...great stuff. George is right on the numbers. 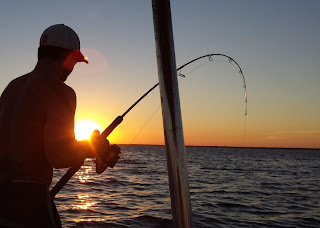 Enjoy a great day of fishing but don't get caught up in the numbers game. As for the tournaments, I agree with George 100%.....keep the tournaments to the little fish....weighing in one fish is better than cranking in a huge number of big fish for a prize. These fish are a prize!! A word on the tackle. "light tackle" may not be quite the best way to talk about what we're using to catch old drum on corks. I grow up surf fishing with big surf rods and when I came here used extra heavy spinning rods and 8000 series reels with 25 and 30 pound test mono. With the advancement of tackle designed for braid, rods and reels are much more capable of landing a big fish in a short time than even just a few years ago. I fish MH spinning rods, really designed for fish other salt water heavy weights, like tarpon, permit, snook and so on. The reels have drags designed to handle as much drag as those old 8000's. So with 30 pound braid, lots of drag, quality reels and rods, we are able to land these fish in 6 to 8 minutes....about the same time we always landed them. That's a true time as recorded on camera on a number of fish. So, no more harm to the fish. Make you jigs barbless to reduce your release time! Keep your trout rods at home until October!!!! Enjoy and appreciate one of the best fisheries on the planet....it's our resource now and for many years to come if we all take good care of it. Looking forward to the vodka!! Because there is a mortality rate associated with fishing for giant red drum, the more you catch, the more you kill. People less experienced at fishing for them and handling them will kill more fish. 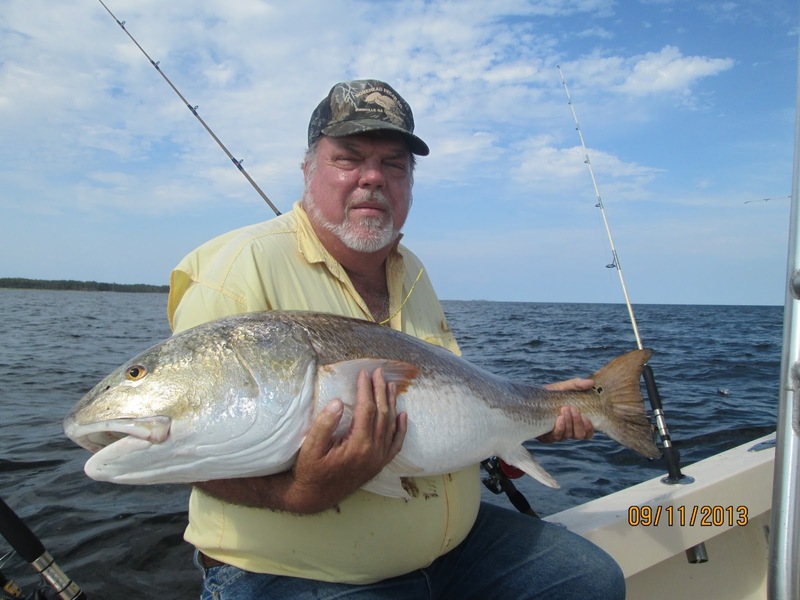 Encouraging people to catch as many as they can……especially for a prize…….is encouraging people to kill as many big red drum as they can. Fishing for these fish should not be a competition. Just ask some of those old timer surf fishermen standing in the waves about the hopes of just getting that one bite and appreciate every bite that you get, not just the next one. Regarding the popping cork craze….... Over the past three mornings I have opened up what I have been referring to as Pandora’s Box……and I’ve liked it a lot. I’ll have to get the key from Gary and have a couple of drinks of Polish vodka before writing that post, if he doesn’t write it himself. Although many locals have occasionally caught a big drum on poppers and popping corks, no one has pursued how effective it can be under the right conditions. I’ve got to give it to Gary, he started a wave that is going to transform this fishery. 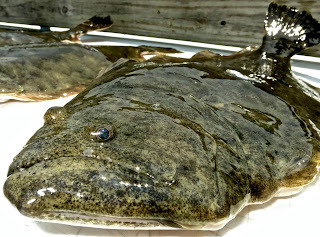 Myself and a lot of other drum fishermen have been shaking our head about what was staring us in the face and we are nursing our bruised egos from not having come up with it ourselves. I have heard criticism that some anglers are using tackle that is “too light”. Although I recommend using tackle heavy enough to wear the fish down, at least in the 20# class, based on my observations, it’s better for an angler to take a little longer landing one fish than a boat load of people trying to catch as many as they can on heavy tackle. Even using tackle too heavy and clamping down on the drag can be more harmful to a drum with a hook in his gut, ripping and tearing internal organs. 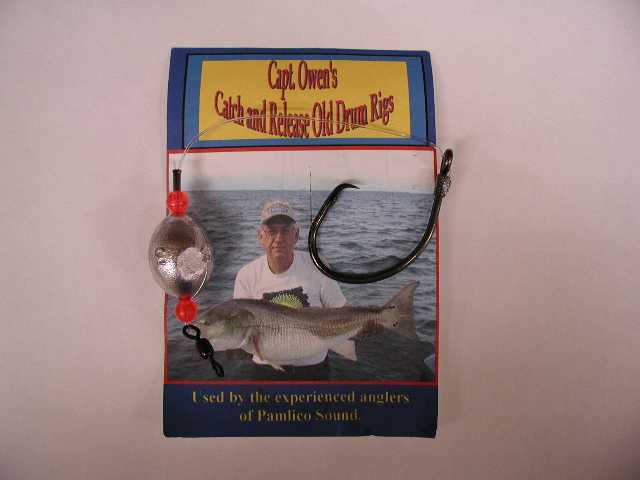 In the late 90’s the secret of the Pamlico Sound Giant Red Drum was getting out. For decades surf fishermen have waited in crashing waves and foul weather for the bite of a lifetime. They would wait sometimes for days and especially at night for the bite of a trophy-sized fish that occasionally would turn into an epic blitz of multiple hook ups. 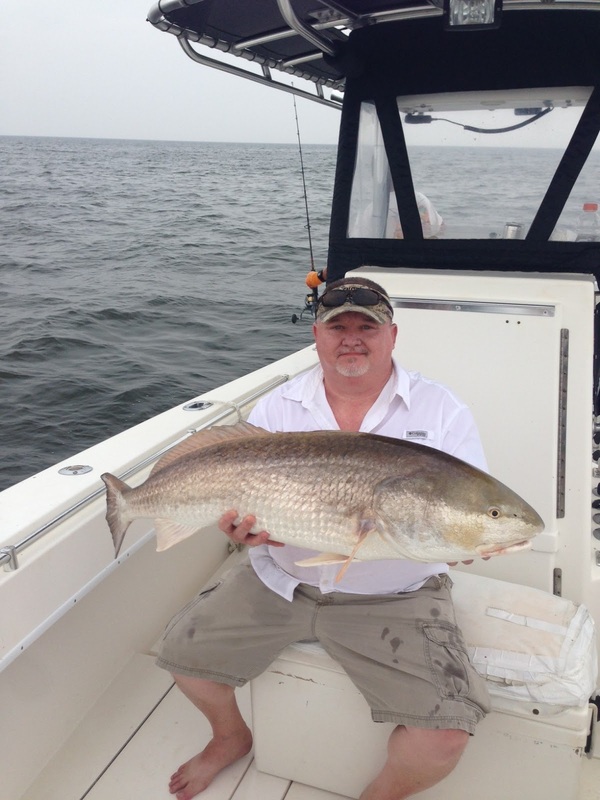 A wave of rumors swept across the sound to outer banks drum fishermen that a few fishermen were reporting double digit releases of giant red drum in the protected waters of the Pamlico Sound and Neuse River. These rumors rolled through the fishing community, across the state and the country and lights from the boats of drum fishermen began to dot the shoal around Swan Island at dusk. As this fishery began to explode, some biologists expressed concerns over the increasing effort on what could be an important spawning population. Until Anna’s research, Chapter 5, it had not yet been documented that these fish were spawning in the Neuse River and Pamlico Sound. Our tagging study documented that at the very least we were fishing on different schools of fish, schools were mixing and that these fish had a much larger range than limited to Swan Island Shoal, where most of the drum fishing effort was concentrated. However, our impacts on the individuals that we were catching were unknown. 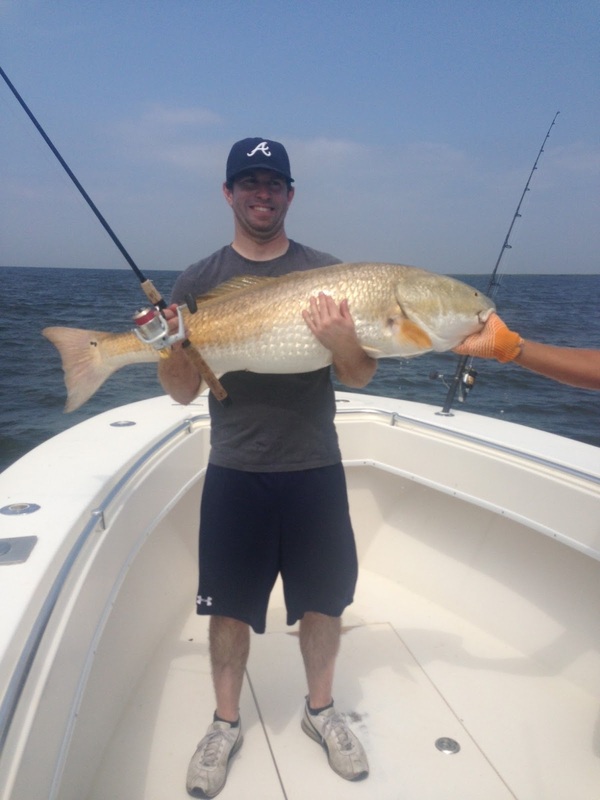 Most anglers were still using j-hooks which gut-hooked a large percentage of big drum. What was the fate of those deep hooked fish? Our tagging study proved to be very difficult and we were limited in what we could learn through the tags, so the focus of our study shifted to learning about mortality rates, circle hooks and how to take better care of our state fish. For the next three years we had two holding pens established, one on the south side of the river near South River and the other on the north side, near Lighthouse Shoal. In the afternoons we would watch the boats pass us by and run the many miles to Swan Island. Each pen had a permanent water quality measuring device recording temperature, oxygen and ph. 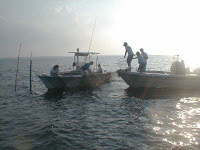 We had a mobile unit on our boat and would record the data at every fishing location. We also recorded the fight time, handling time-- the amount of time that the fish was out of the water while we were measuring and tagging it and the transport time to the in-water holding pen. Initially we would hold them for 3 days, but all mortalities occurred within the first couple of hours, so that time was eventually shortened to one day. 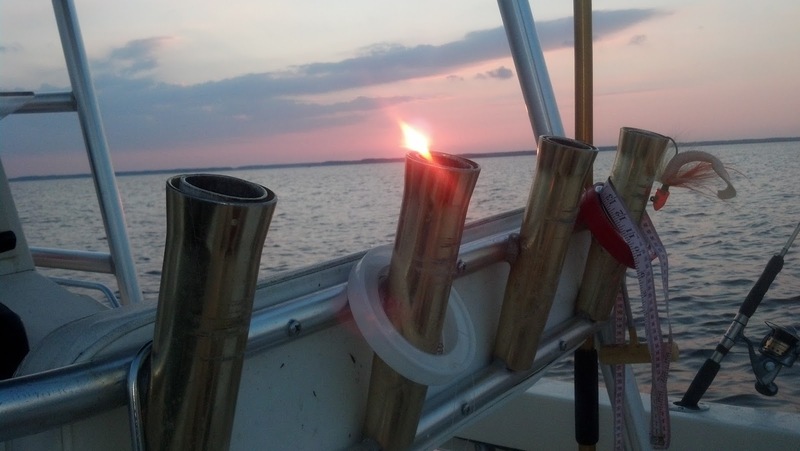 We primarily used j-hooks in this study so that we would have a sufficient number of deep-hooked fish to observe. Regardless of the fight time, including some fish that were caught on 4# and 6# test, regardless of the time that these fish spent on the deck, waiting to be worked up and put in a transport tank, regardless of the time it took to get them to the pens, these fish proved to be extremely hearty. The only thing that they cannot survive is a j-hook through the heart or laceration of the liver, causing major internal hemorrhaging. In three years, all the red drum that died except for one was deep-hooked. The one exception was a fish that I dropped on the corner of the gunnel so hard that we made a note of it in the data. We were very careful with handling these fish, not lifting them by the gills and carefully supporting them. 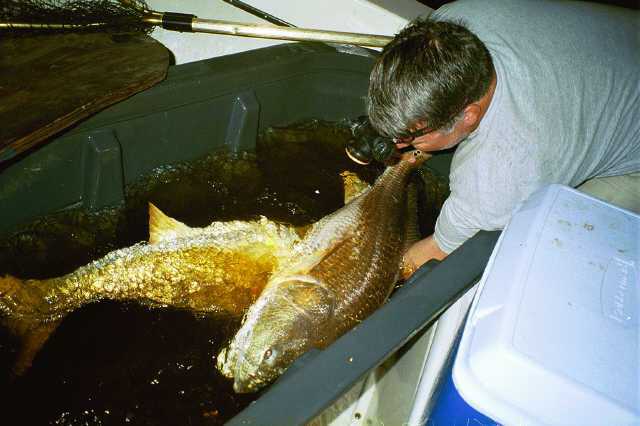 Although more surprising to biologists than to drum fishermen, giant red drum did not succumb to long fight times and rough handling like other species. What was shocking to all of us was the very high survival rates of deep-hooked fish, at least over the short term. One drum that was deep hooked and took to an aquaculture facility for longer observation expelled a j-hook that it had injested…..probably just as they do blue crab parts. If you are going to live to be 65 years or older and eat whole blue crabs for a living, you better figure out how to get rid of a claw stuck in your craw. Our study showed that deep hooking rates, while using a 7-0 j-hook, a 2 foot leader and a 2 oz. sliding weight was 50%. There had to be a better way and circle hooks were coming on the scene, but they were not the answer. Same rig, 14/0 Mustad circle hook, deep hooking was cut in half to around 24%, but this was still not good enough. The best reduction in deep hooking, only 11%, was with a 16/0 Mustad, the same hook that Bluefin tuna fishermen were using. Then Owen Lupton introduced me to his rig. 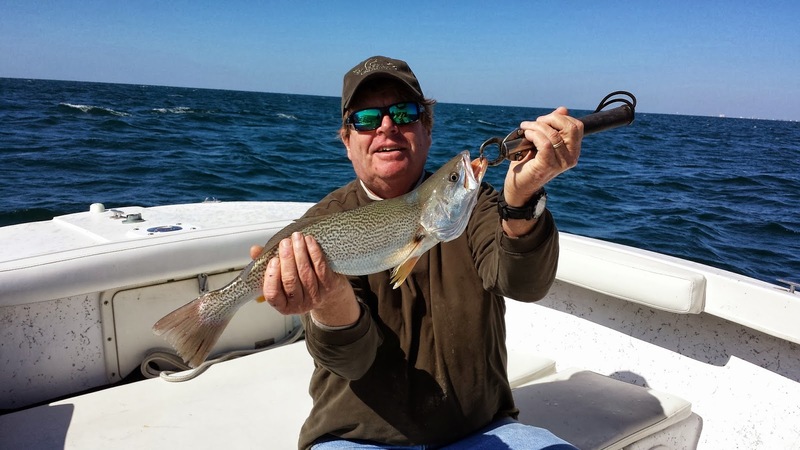 Prior to retiring, Owen Lupton taught a commercial fishing occupations class at Pamlico County High School where he taught young kids the art of being a working waterman. 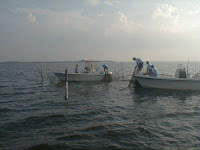 In addition to how to make crab pots and hang nets, he also taught ethics and tested new techniques to reduce bycatch. The school even had a shrimp boat that the kids would work on through the summer, raising money for the class. It was from this shrimp boat on a July day in 1976 that Owen and a student of his named Rick Caton caught the first tarpon landed on rod and reel in the Pamlico Sound. When Owen gave me a handful of his rigs, using a circle hook almost exactly the same size as the 14/0 Mustad that we had tested, a 3 oz weight that was crimped in place so that the leader was only a few inches long, I nearly dismissed it. He insisted that I try it. Because we already had good data on a similarly sized circle hook, I copied Owen’s rig, making it up with the circle hook that we were already testing. I was amazed at the results. 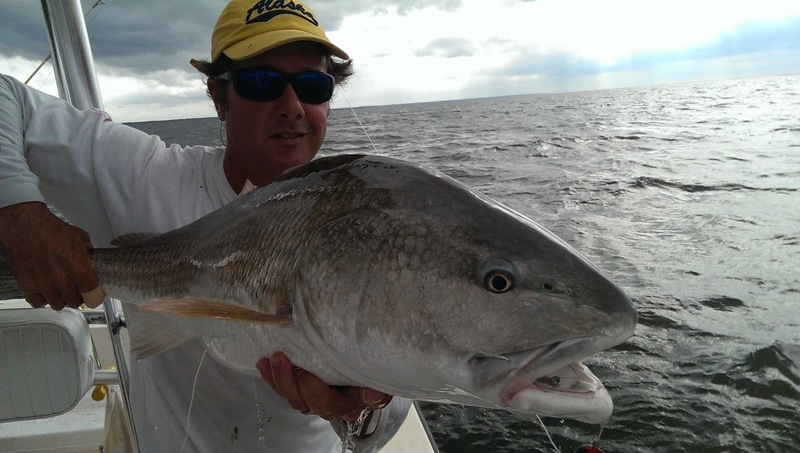 Effectiveness did not seem to be hampered, but after several hundred giant red drum releases, only about 4% of them were deep hooked. 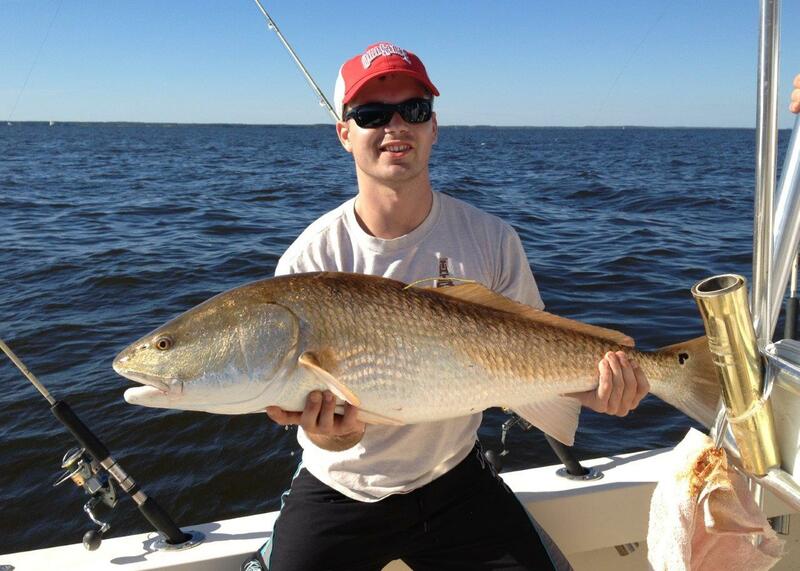 In our study, of the deep hooked red drum, nearly 12% of them died. If 50% of the drum being caught on j-hooks are deep hooked, then the overall mortality is about 6%. That is unacceptable for a fish that lives so long and is so important to the future of this fishery. 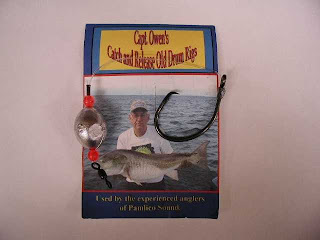 With Owen’s rig, IF the mortality rate is the same as the j-hook, but we are only deep-hooking 4% of the drum, then we can get overall mortality rate to less than 1%.......hence the current regulations of mandatory use of short leader rigs while fishing with bait at night, which is when most drum fishing occurs. Wow, this was a long one. Next Rants may be by guest speakers. Fishing has been good. 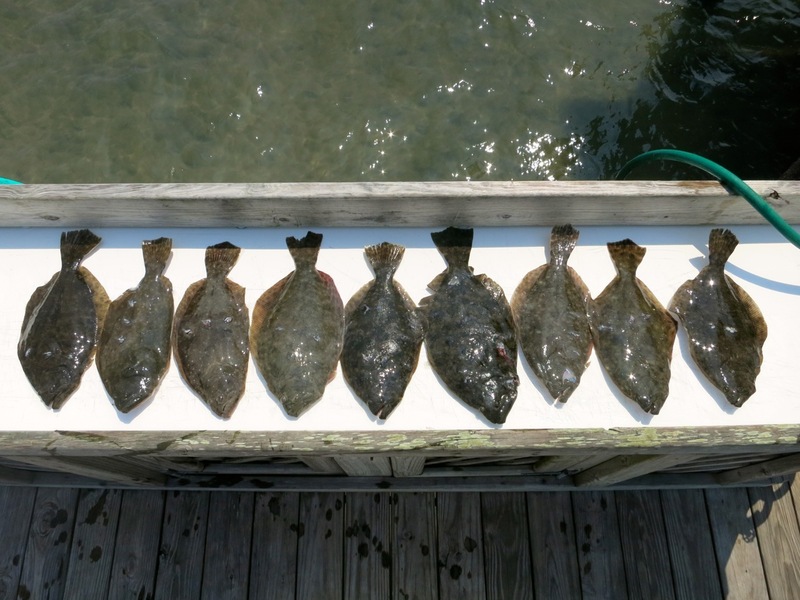 Still solid catches of flounder in the ocean and fair numbers showing inside. We are catching good numbers of blues and spanish mostly casting with limits on many trips. Just trickle of kings starting to show but with NE winds coming their numbers should be steadily increasing. 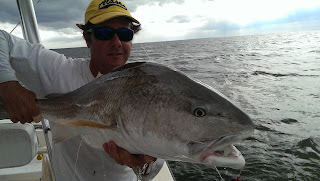 Still plenty of amberjacks, seabass, triggers and groupers offshore. And the occasional giant squid. David and Jim had a great time today. Here are the pictures from my camera for your use. Thanks again for the trip." The next Rant will go into more detail, but these drummies are just fine.. The picture should be prefaced by saying that these guys were really good at landing and handling fish, they got A LOT of practice in two days. These 4 drummies came over the side at the same time, a quadruple header, I tagged and measured them, then scurried up the tower to take the shot and over the side they went. They are all fine! None of them had a j-hook through the heart. Lee is fly fishing for tarpon for a week in Costa Rica. If you want at tarpon, this is the place to go. Although I'm not putting up the numbers with the drum, I'll give you Lee's numbers when he's finished. All on the fly. "Yesterday was terrible missing three fish. None in the boat.This morning is awesome just boated a fish close to 200+ or minus the biggest fish I ever caught in my life on the fly. Also caught one at 5:30 in the morning about 130 pounds. The day is young. Having an awesome time. Trip of a lifetime." Interesting day, Capt. Richard Andrews sore mouthed a bunch of them this morning, Capt. Greg and I got out a bit later and struggled, but each of us still managed nearly a double digit afternoon. After a slow start Capt. Brian Harrington made adjustments at the right time and continued to do what he does best with Never Enough. Seems that a slug of dead water moved things around or the river turned over a bit. No worries, they're still around and the fishing is still excellent and will continue to be really, really good through at least the next big moon with plenty of big drum in the river into October. Pics and another Drum Rant if I can get a few quiet hours. 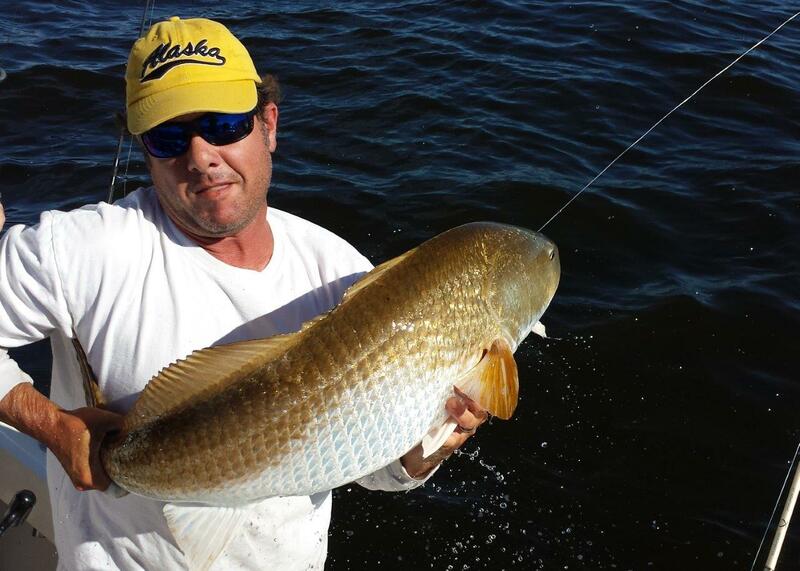 Tarpon are not all gone, albies are blitzing at the coast and the drum fishing is EPIC. Plenty of great fishing through the fall and plenty of openings with the Down East Guides, call us now to book your trip. Don't wait until after this drum bite is over. Crowd was amazed at what took place today! We got over several schools watching them feed and the boys unleashed.......using your words, EPIC. Today was pretty amazing. We broke the Silver King record for the most fish caught on the fly rod in one day. I caught 11 fish before 12 noon. We hooked 22. The largest was 160 pounds. During the afternoon we did not get one bite. What a difference an afternoon makes. A perfect day for my 62 Birthday. There is nothing lousy about catching 2 tarpon on the fly in a day. Hope things improve, but if you can catch a couple/day, you’re doing good. The fishing was extremely slow yesterday. Three Boats from various sources Were using Bait. They didn't catch any fish.. We were lucky we hook three and caught the 130 and 170. Two great fish on the fly for a lousy day. Also caught a 20 pound Tripple tail on the fly. ….and not that you need another random picture of a sunset, but I thought you might also enjoy the one attached. 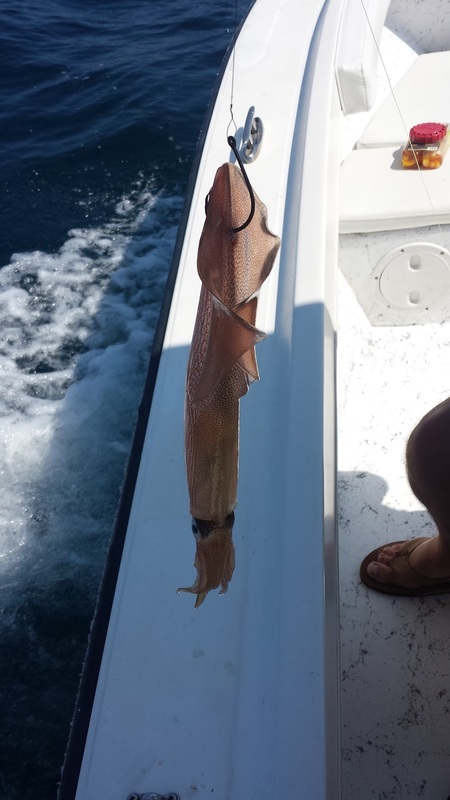 How'd you like to come across this on a Gulf Stream trip? Thanks for the picture Pat, that's just freaky. Yes, we can make this happen also. 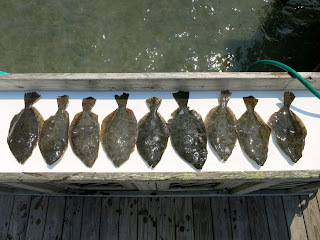 Drop us a line to book your flounder gigging trip. Many thanks Frank for the pictures from your recent trip. Tagging big drum with transmitters, then using a grid system to relocate them was proving to be much more difficult than we suspected. If we were going to learn anything about these fish, we needed to concentrate our effort into following individuals and monitoring their behavior. Hopefully we would run into some of the other several dozen fish that we had tagged with transmitters, learning where they were congregating and hopefully where they were spawning. In 1999 very little was known about big red drum, including where they were spawning and if that was even occurring in the Neuse River. If so, this would be one of the few red drum populations that was documented as spawning somewhere other than the open ocean. 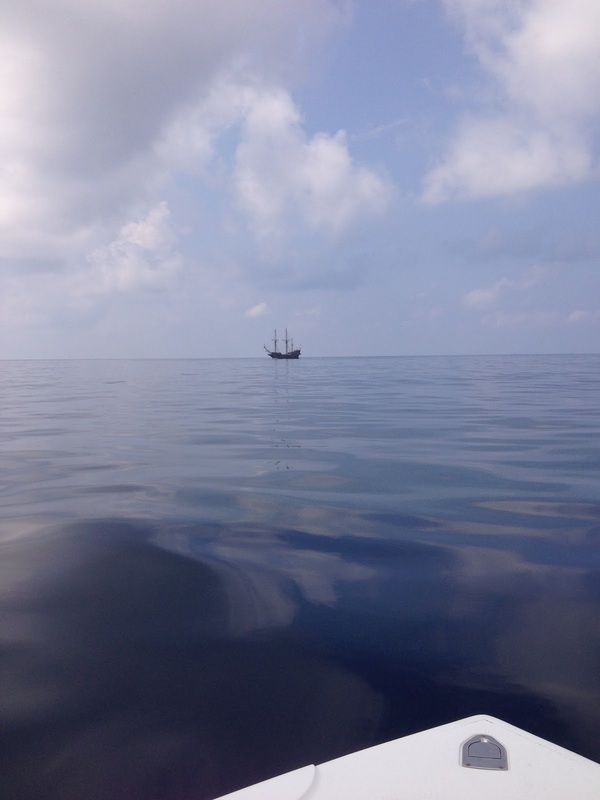 To better track individuals, we recruited another boat. The plan now was to tag a fish and follow that fish for 24 hours/day for 3 days. We would use two boats with 12 hour shifts on each boat. We would start that afternoon, this time fishing in the center of our grid, off Turnigan Bay, hopefully tagging a fish, following it through the night and having our relief boat pick up the trail the next morning. This fish that we tagged off Turnigan Bay that night was a special fish. We got it in the boat, measured it’s girth, standard, fork and total lengths and we tagged the fish, but the transmitter wasn’t working. It took a few minutes to get another tag prepared and I was dumping buckets of water on the fish to keep it from drying out. With the fish now ready to go, bleeding from 3 tags, the tag from the failed transmitter which was now removed, a regular NCDMF tag and the tag with the new transmitter. 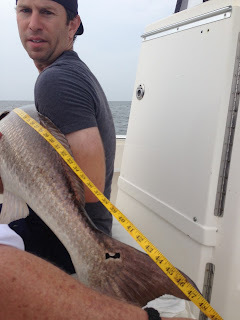 This big drum was very weak when we released it after being in the boat for many, many long minutes. I spent some time reviving it and he slowly swam off. We slowly followed the fish into the night, the fish traveled a couple of miles then stopped. Was it dead? We got close to the fish and quietly anchored the boat. Every few minutes we would put the hydrophone in the water and listen to the strong signal of the “beep”. It wasn’t moving. Several hours later, just as the sky was lightening to the eastward, we put the hydrophone in the water and the “beep” was much fainter, this fish was not dead, but on the move and so were we if we were going to keep up with it. This fish was not only moving, but also moving really, really fast along the deep edge of the shoal. As the sky was lightened, birds started to pick, slicks started to pop up and we would actually see a drum occasionally bust the surface. Our tagged fish appeared to be in a school. The biologist using the hydrophone pointed in the direction that the beep was coming from and a couple hundred yards away, exactly where he was pointing, a big drum came to the surface and crashed a crab. The drum that we were worried about surviving 10 hours earlier was now actively feeding and apparently rejoined a school. This was fantastic news. Over two years, we tagged several dozen drum with transmitters and followed them for countless hours, dodging daily thunderstorms and weathering nor’easters on the water, through scorching days and dark, rough nights. This is some of what we learned. We NEVER found the same fish in the same place on two days in a row! Don’t worry about it if someone is “in your spot”, just get in the similar depth of water and keep your distance, you’ll get ‘em. It may be a good spot and drum may pass through there every day, but it may not be the same drum. Most of the drum that we tagged traveled the 8-14 foot drop off, that’s always a good bet, but if they weren’t there, they would often be running the shoreline. We repeatedly observed schools and individuals of red drum, just “laying up” in an area for hours. Perhaps they were sleeping, perhaps they were slowly following schools of menhaden, eating the scraps from feeding bluefish, but these fish were not working hard and not moving much at all. This behavior was seen most often in the middle of the day and late at night/early in the morning. The secrets of catching drum exhibiting this behavior have recently been unlocked. Although Capt. Gary Dubiel and I are often like oil and water, I have to give him the credit he is due for pioneering the popping cork craze. Drum caught and tagged together would later be found apart, perhaps with other drum that we had tagged. Days later the two fish would be back together in the same school again. 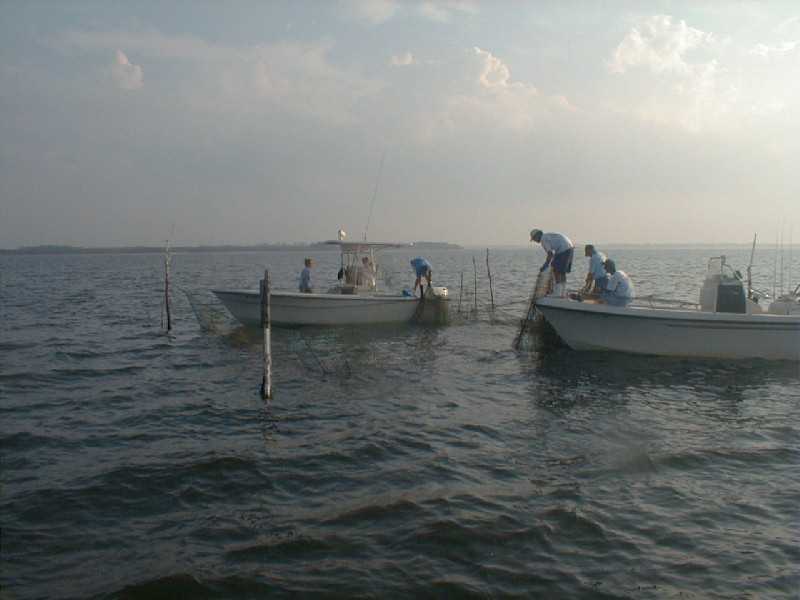 There seemed to be a lot of mixing of schools and these schools were covering a large area, alleviating worries that drum fishermen were concentrating their effort on one small spawning population. 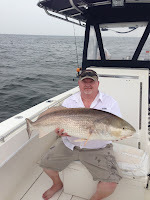 But there were concerns about these recreational fishermen, most of them fishing at night and most of them using j-hooks and deep-hooking huge numbers of big drum. What was the mortality rate of these deep hooked fish? Some suspected that mortality of deep hooked drum would be near 100%. If this were true, then recreational fishermen could due irreparable damage on the spawning population. Regardless of the actual mortality rate, there has to be a way of reducing deep hooking which cannot be good for those fish. The focus of our study changed from identifying drum movement and preferred habitat to documenting mortality rates of deep hooked fish and how to reduce deep hooking. We began to explore with circle hooks and tag some deep-hooked fish with our transmitters. 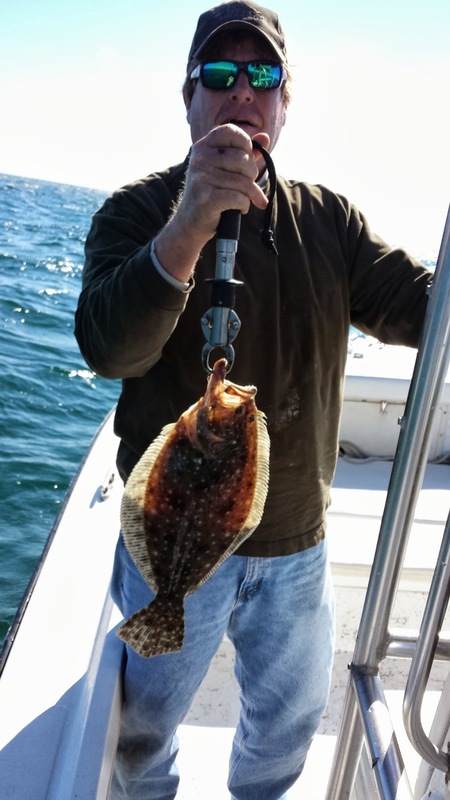 Instead of retrieving our transmitters off of bloated, floating dead drum, the deep-hooked fish that we tagged seemed to have done reasonably well, surviving the deep hooking experience. With only a few deep hooked fish with transmitters and our season coming to an end, plans were already in the works to focus on the impacts of hook and line fishing. I’ll sum up our findings of the next three years of research in the next rant. I just wanted to send you an email with some pics from our trip with Brian and Justin. We all had a great time and made some more memories at Oriental! Brian and Justin were great. Please thank them from the whole crew at CSI again. 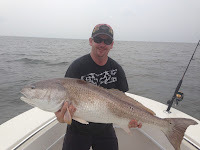 Highlights of the trip were four fish over 50”. This was also the first time 3 of our group had caught big drum. Shaun caught a 49” fish and Curtis caught a 45” fish Pretty awesome stuff. We will be back!